Almost two years. Well, one year, 11 months, and 2 days. It’s crazy how time flies when you’re not thinking about it. It’s also crazy what we managed to accomplish in that timeframe, even if many of us are still looking to keep going further. Shows, videos, recordings of shows, recordings in a studio, barcodes, ISRCs, finally signing up with SOCAN… signing autographs, signing CDs, a small roadtrip and tour – it’s all given me a taste of what can be done, and a hunger for more. It’s not going to be easy, and it’s going to involve thinking long and hard about how my life is currently structured, and how it has to change if I’m going to give music the time and energy it deserves. Energy is something I’ve been struggling a lot with over the past two years, and though many people take certain shortcuts to try and force that last little bit of juice out of themselves, that’s a surefire path on the way to incredible burnout. If I’m going to be setting myself up to handle cross-country touring, I need to start with my body and mind – struggling to carry my own gear, night after night, is not how I want to remember a tour – there’s a reason a lot of musicians end up with decent muscle: amplifiers are heavy! Time, however, is the hardest to get back. As a child, even a teenager here, you spend your summer holidays playing games, generally being bored, and not caring too much about the world. How I wish I had that time back to make something of myself – with a dayjob and massive commute now, I’m lucky I get a few weeks to pick off, if projects permit. That’s basically a bit of studio time, and maybe a very small tour a year. That’s no time to write, or practice, or do all the paperwork and planning that has to happen to make this work in any sort of reasonable timeframe. I love the scenery and I love the mild weather here in Vancouver, but I hate the traffic, and the cost of living. As it stands right now, I’m working full time and yet still back living in my parents’ basement (after having run myself up to my credit limit trying to live on my own, and subsequently paying it all off after moving back) – I keep crunching the numbers over and over, and I quite literally can not afford to move out anywhere in Metro Van; even the far reaches of the Fraser Valley and Vancouver Island are borderline, at best. There’s something soul-sucking about struggling to get home before 7PM every night, only to want to crawl straight into bed the moment you get through the door, night after night, week after week. So I have a lot of thinking and planning to do there, with where I’m going to have to relocate to give this the time of day it deserves. Splitting the cost of a small apartment between bandmates just to rent out a frigid room in a jamspace over 45 minutes away isn’t tenable long-term, not to do this right. I’m looking at my options and saving up for a move at least part way across the country to get a solid foundation started, but there’s only so much I can do while waiting for paycheque after paycheque to roll in, mostly doing my damndest to keep my costs down over the next year or two (or three) it will take. I’m bored of death metal. 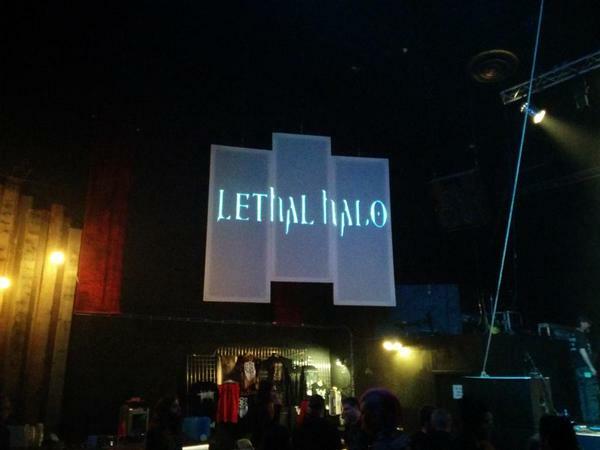 I wasn’t completely sold on it when I joined Lethal Halo, but the musicianship kept me in, particularly as we kept our new material decidedly on the ‘melodic’ side, but death growls and screams do nothing for me. They never did, unfortunately; I gave it my best shot, I think we put on some pretty brutal shows, but even our peers and contemporaries don’t particularly interest me. I don’t want to feel bad for being bored when the other bands we play shows with get on stage. I don’t want to be picking apart their recordings for what I perceive as shortcuts and inadequacies when they’re really just staying true to the style – I have to face the fact that it’s not their fault, but I’m just not enamoured with the style. So where do I go next? I’m not sure. I’m going to start by stripping everything back to basics, playing around on my shiny new 7-string acoustic, and see what comes out of me at the most basic level. If it deserves other layers, then it can get them, but only if warranted. 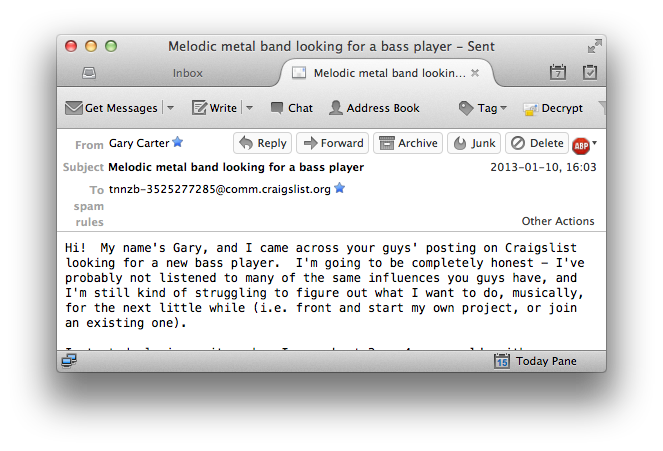 No starting with ‘well it needs three guitars and two solos and a bridge’.